Mary Dermody is destined to be together with George Germaine one day, or so at least her grandmother prophesizes. Destiny at first doesn't seem to adhere to this plan, and the pair is separated and lose sight of each other. But when George saves a young woman from drowning, a strong connection seems to develop between them, which seems to be almost supernatural. . . .Why was she waiting there at the close of evening alone? As the question occurred to me, I saw her head move. She looked along the bridge, first on one side of her, then on the other. Was she waiting for some person who was to meet her? Or was she suspicious of observation, and anxious to make sure that she was alone? A sudden doubt of her purpose in seeking that solitary place, a sudden distrust of the lonely bridge and the swift-flowing river, set my heart beating quickly and roused me to instant action. I hurried up the rising ground which led from the river-bank to the bridge, determined on speaking to her while the opportunity was still mine. I'm not sure how I feel about this one. There were parts I loved and found fascinating, other parts I was confused by and disliked, and the ending was a little odd. 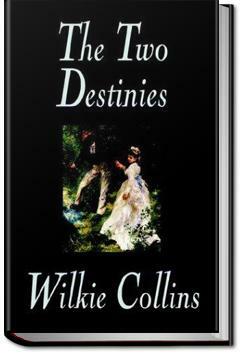 Still, an interesting read, and I look forward to more Wilkie Collins in the future. I didn't find this to be one of the better Wilkie novels. It set out with great promise, but fell short and started to drag. A delightful, super-natural romance from Mr. Collins, author of The Woman in White. Can anything separate those truly destined to be together? Can destiny and pure love overcome distance, wealth and *gasp* social classes? Only Old Dame Dermody has the answer.